Why Take Senior High at Xavier? K to 12 Program. The two years will be added after the four-year Junior High School (Grades 7-10) program to provide sufficient time for mastery of concepts and skills, develop lifelong learners, and prepare graduates for tertiary education, middle level skills development, employment and entrepreneurship. When will the Senior High School be implemented? Senior High School students will take Grade 11 in SY 2016–2017 and Grade 12 in SY 2017–2018. The first batch of high school students to go through the K to 12 Program will graduate in March 2018. Why do we need two more years in high school? Only Grade 12 graduates will now be accepted for college starting 2018. What is going to happen in Senior High School? Students will be made to choose from any of the specializations under one of the four tracks: Academic, Technical-Vocational, Sports, and Design and Arts. 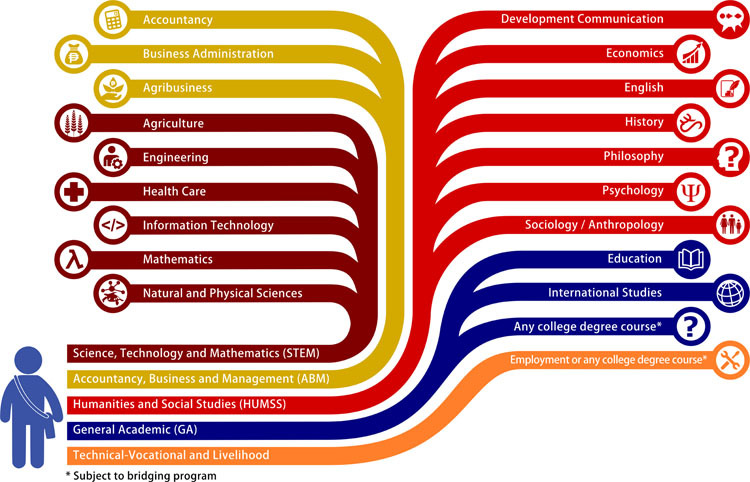 The Academic track is recommended for those who will proceed to college. Under the Academic track, the student can choose from any of the four strands: STEM (Science, Technology, Engineering and Mathematics); ABM (Accountancy, Business and Management); HUMSS (Humanities and Social Sciences); GA (General Academic). Under the Technical-Vocational, students can choose from TESDA-accredited programs like automotive, electronics, electrical, mechanical and the like, as well as non-TESDA vocational programs. In the Sports track, various skills may be learned to prepare the student for sports-related employment. For Design and Arts track, the students are prepared for employment and engagements in the performing and visual arts, among others. Is XU ready for Senior High School? Xavier University has been preparing for this transition since 2014. Its Center for Integrated Technologies (CIT) has already received approval to offer the Tech-Voc track in SY 2014-15. CIT has partnerships with BMW, Toyota, General Motors and local companies to employ its graduates. The main campus along Corrales Avenue, including all its improved facilities and resources, will cater to the educational needs of Senior High School students. Beginning SY 2016-17, its existing dynamic faculty, considered experts and experienced in their fields, will be tapped for the new Senior High School programs.